Fabulous filly from the Group 1 winning mare Imananabaa. 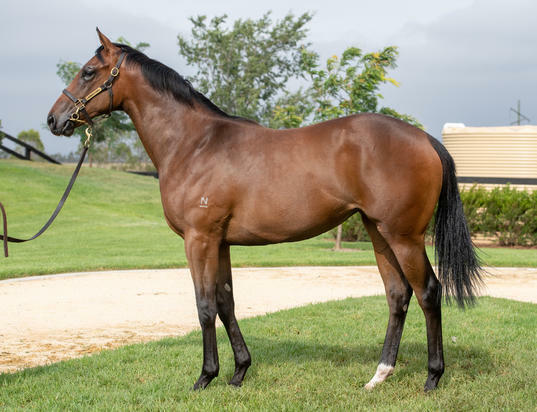 This filly was purchased at Inglis Classic sale on 11/2/19. She is by Super One, an exciting first season sire by I am Invincible. He stands at Newgate. This filly was purchased for a bargain $25,000. She ticked all the boxes, predigree, type, walk, xrays. We are thrilled to have her join our team. SUPER ONE (AUS) (Bay 2012-Stud 2016). Champion 2YO in Singapore in 2015. 5 wins at 1100m, 1200m, A$95,130, S$374,375, SAJC DC McKay S., Gr.3, Singapore TC Aushorse Golden Horseshoe, L, Juvenile Championship, L, Make Your Own Magic 2YO S., IRT Juvenile S., 2d Cranbourne TC Apache Cat Classic. Half-brother to SP Super Too (2d VRC Crown Resorts P., Gr.3). Related to SW Les Arcs (Newmarket July Cup, Gr.1), etc. His oldest progeny are yearlings. All in Rhythm (g. by More Than Ready). 3 wins-1 at 2-to 1400m, A$79,125, to 2017-18 in Aust. I Am the Rock (g. by Fastnet Rock). 2 wins at 1400m to 2017-18 in Aust. Imanana (f. by More Than Ready). Winner at 1200m in NZ. Aloneinabaa (g. by Lonhro). Placed at 3 in 2018-19 in Aust. Anthology (f. by Encosta de Lago). Placed, 3d Scone RC Newgate Stallions P.
IMANANABAA (Anabaa). 5 wins. See above. Lakers Bay (Magic Albert). 5 wins from 1400m to 1750m, CJC Win a Ford Fiesta at Riccarton Park H., 2d MRC Alannah & Madeline Foundation H., Riverton RC White Robe Francolin S., 3d Otago RC White Robe Lodge H., Gr.3, Natural Destiny at Clearview Park H., 4th CJC Great Easter S., L.
Music Maestro. 6 wins from 1400m to 2000m, A$129,995, AJC Starcraft at Arrowfield H., 2d AJC Ryan Wilks Pty Ltd H., Sky Chase H., STC Baby & Children's Expo H., Caravan Camping Supershow H., 3d ATC Lawler Partners H., BRC Channel Seven H.
Abukuda. 2 wins-1 at 2-at 1350m, 1600m, BTC Glenlogan Park 2YO S., 2d BTC Bernborough Bar H.
Born to Excel (Exceed and Excel). 4 wins to 1300m, A$180,825, WATC Westspeed 3YO H., Facebook.com Perthracing H., Westspeed 3YO H., 3d WATC Sir Ernest Lee-Steere Classic, Gr.3. SIMPLY ADORABLE (Blackfriars). 2 wins at 1700m, 2300m, A$191,415, Pinjarra Cup, L, 3d WATC Perth Cup, Gr.2, Bunbury Cup, L, WATC Energy World H.
SCENIC SILVER (Scenic). 9 wins-1 at 2-from 1150m to 1600m, A$249,710, TTC Newmarket H., L, MVRC Geoff Webb P.H., 2d TRC Thomas Lyons S., L, 3d TTC Tattersall's George Adams P., L.
THE HEAVYWEIGHT (Zeditave). 8 wins-3 at 2-to 1200m, A$377,935, VRC Maribyrnong P., Gr.2, VATC Debutant S., L, 2d AJC Hobartville S., Gr.2, Royal Sovereign S., Gr.3, VATC Blue Diamond Prelude, Gr.3, Merson Cooper S., Gr.3, AJC Hall Mark S., L, 3d AJC Galaxy H., Gr.1, VATC Oakleigh P., Gr.1, AJC Shorts H., Gr.3, VRC Standish H., Gr.3. HAPPY STRIKE - LISBOA STAND (Mac.) (Gold Fever). 9 wins-1 at 2-at 1000m, 1200m, A$166,250, M$2,716,650 in Aust. and Macau, MRC Vain S., L, Macau Directors' Cup, L, MRC Newminister 2YO H., Macau Bundarra H., 3d MVRC CS Hayes S., Gr.3. MALIBU STYLE (Magnus). 10 wins to 1300m, A$675,625, to 2018-19, WATC RS Crawford S., L, MRC Doveton S., L, Bel Esprit H., L, 3d VRC Gilgai S., Gr.2. EXCELORADA (Exceed and Excel). 10 wins at 1000m, 1100m, A$351,990, WATC RS Crawford S., L, Summer Scorcher, L, 2d WATC RS Crawford S., L, WATC S., L.
Danarich (Danehill). 2 wins at 1550m, 1600m, A$143,300, VATC Oakford Thoroughbred H., MVRC Night Racing H., 2d VATC Angus Armanasco S., Gr.2, 3d VATC Gipsy Queen H. Producer. Little Doutes (Redoute's Choice). 3 wins to 1400m, MRC Wiggle H., SAJC Owen Stanley Ranges H., 2d SAJC Cinderella S., L, 3d MRC Bint Marscay 2YO H.
SO ANYWAY (General Nediym). 2 wins-1 at 2-at 1000m, 1400m, A$355,525, Scone RC Dark Jewel Classic, L, 2d VRC Thoroughbred Breeders S., Gr.3, 3d AJC Surround S., Gr.2, STC Reisling S., Gr.2. Lie in Wait (Hold That Tiger). 8 wins from 1000m to 1900m, A$236,995, WATC Gate & Bar Bistro H., Perthracing.com.au H., Puntathon H., 3d WATC Grandstand Cup, L.
Anabatik (Anabaa). 6 wins-3 at 2-at 1000m, 1200m, A$12,040, HK$5,562,500, HKJC Ash H., Chinese Recreation Club Challenge Cup, 2d HKJC Juvenile Sprint Trophy, L, 3d HKJC International Sprint Trial H., L.
Noble Champion - Profiting Champion (H.K.) (Belong to Me). 2 wins-1 at 2-at 1000m, SAJC Princesses Prepare 2YO H., HKJC Kowloon Cricket Club Centenary Cup, 2d HKJC Castle Peak Bay H., 3d MRC Blue Diamond Preview (c&g), L.
ROSTOVA (Testa Rossa). 5 wins-4 at 2-to 1400m, A$756,475, SAJC Robert Sangster S., Gr.1, VRC Sires' Produce S., Gr.2, MRC Blue Diamond Prelude (f), Gr.3, VRC Ottawa S., L, MRC Blue Diamond Preview (f), L, 2d MVRC Champagne S., Gr.3, 3d AJC Sires Produce S., Gr.1, MRC Rubiton S., Gr.3, 4th AJC Galaxy H., Gr.1. Producer. MYSTIC MASTER (Snippetson). 2 wins at 1000m, 1200m, S$248,183, Singapore TC Juvenile Championship, L, 2d Singapore TC Magic Millions National Yearling Sale S., Kranji Nursery S., 3d Singapore TC Silver Horseshoe Open 2YO S.
TRIGGER EXPRESS (Citidancer). 10 wins from 1400m to 2000m, 600,000Rgt., S$826,019 in Malaysia and Singapore, Selangor TC Piala Emas Sultan Selangor, L, Singapore TC Chairman's Trophy, L, Queen Elizabeth II Cup, L, Open H.-twice, 2d Singapore TC Hong Kong Jockey Club Trophy.